Detailing the physical features, habits, territorial reach and other identifying qualities of the Clover Hayworm Moth. Clover Hayworms ruin good hay, but can also cause trouble in homes decked out with dried floral arrangements. The overall color of Clover Hayworm Moths fall between wine-purple and deeper shades of purple. A wide yellow fringe borders the bottoms of the forewings. Each wing has two yellow spots on the outer edge. Faint yellow lines curve across the wings, connecting the left and right spots. Eyes are large and legs are yellow. The caterpillar of this moth is called the Clover Hayworm. Clover hay is harvested and bundled for use as horse feed. The larvae worm their way into haystacks and cover them with caterpillar silk. Inside, they feed on the leaves of the clover plant, ruining the bundles. A full-on infestation can occur inside hay barns making them an agricultural pest. Their diet also leaves room for other dried plant matter and homes decorating with dried flowers may also see activity. Dried herbs are also attractive food sources. 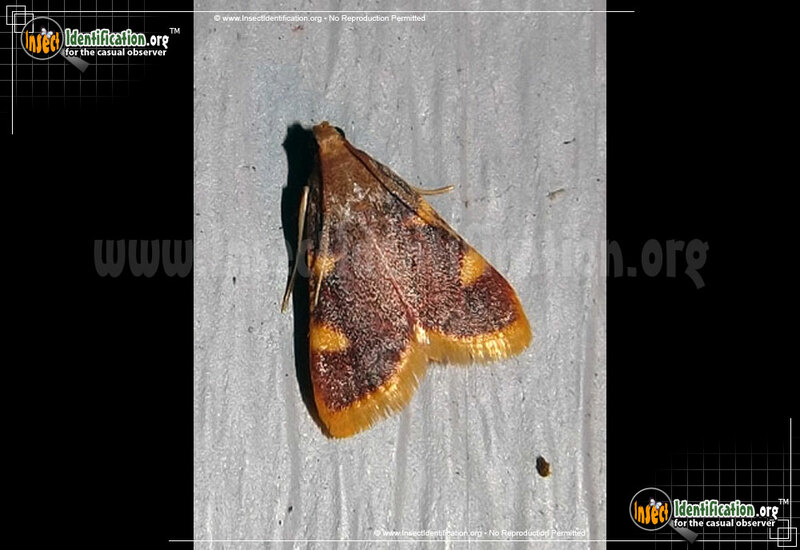 In their natural environment, however, the Clover Hayworm Moth and its larvae are not considered a nuisance.